Fernando Torres delivered a scintillating solo performance to torment his old adversaries Real Madrid and send Liverpool into the Champions League quarter-finals. Torres, for so long the symbol of Real's fierce rivals Atletico Madrid, returned from injury to spearhead a Liverpool display that once again re-inforced their credentials in Europe's elite competition. He put Liverpool ahead after 16 minutes when he turned in Dirk Kuyt's cross from close range - although Real complained bitterly that defender Pepe had been fouled in the build up. 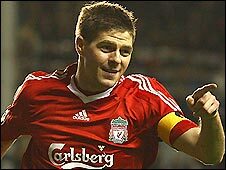 Real also felt they were harshly treated when Steven Gerrard scored Liverpool's second from the spot 12 minutes later after Gabriel Heinze had been penalised for handball. The brutal truth for Real was that they were outclassed, with Liverpool underlining their vast superiority when Gerrard slammed home the third from Ryan Babel's cross two minutes after the interval. Substitute Andrea Dossena completed a dream night for Liverpool by scoring his first goal for the club with two minutes remaining. Only a show of outstanding one-man defiance from Real keeper Iker Casillas stopped Liverpool from running riot even more in front of a delirious Anfield gallery. 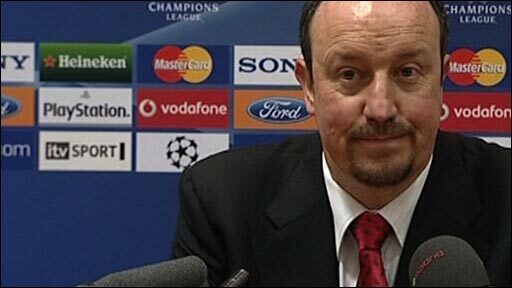 Liverpool boss Rafael Benitez demanded respect for his European record in the build-up to this tie, and it will be given after a performance that once again demonstrated that for all his inability to claim the Premier League so far in his Anfield reign, there are few finer operators in this form of football combat. Real coach Juande Ramos was wearing the look of dejected resignation that characterised much of his brief reign at Spurs long before the final whistle, with the Spanish champions looking one-paced and ageing in crucial areas thanks to the vibrant nature of Liverpool's display. The brilliance of Torres was ably supported by Gerrard on his 100th European appearance for Liverpool as the pair delivered compelling evidence that they can be the driving forces for another assault on Rome, where Liverpool won this trophy in 1977 and 1984. Liverpool were able to recall Torres after the ankle injury he sustained in the first leg in the Bernabeu - and he was the focal point for a first-half display that put the tie firmly out of Real's reach. If Real needed the impetus of an early goal to put Liverpool under pressure, they were not given a chance as they were subjected to a siege in the opening exchanges. Torres was almost untouchable, signalling his intentions in the third minute with a turn which left Fabio Cannavaro in his wake, but Casillas denied his Spanish international team-mate. And Casillas showed his class again from the resulting corner, leaping acrobatically to turn Javier Mascherano's 20-yard drive on to the bar. Real were not being given any opportunity to fashion attacks or bring order to their play, and even though Liverpool's opening goal in the 16th minute was hotly-contested by Ramos' side, they could not complain at being behind. Pepe insisted that Torres had hauled him down as they chased a long ball, but Liverpool's striker did not wait for the whistle, racing to the edge of the six-yard box to apply a simple finish to Kuyt's cross. Liverpool were playing in the positive and fluent manner that has eluded them so often at Anfield this season, and Casillas was in action once more to save Martin Skrtel's header. And Torres was at it again when he pulled the ball back from the touch-line for Gerrard, but Casillas, a shining light amid this fiasco of a performance from Real, was again equal to the occasion. Liverpool doubled their advantage after 28 minutes, but once again Real were left cursing the officials when Heinze was penalised for handball. The former Manchester United defender, who almost joined Liverpool, pointed to his shoulder, but it was all in vain as Gerrard powered home the penalty. It effectively ended the tie, although Real belatedly twitched into life as Liverpool keeper Pepe Reina was twice forced to save from Wesley Sneijder and Gonzalo Higuain. The only cloud on what was virtually a perfect opening period for Liverpool was a yellow card for Mascherano for kicking the ball away. Real made a change at the interval, replacing the subdued Arjen Robben with Marcelo - but any hopes of an unlikely revival were snuffed out when Gerrard added Liverpool's third two minutes after the break. Babel is clearly not a favourite of Liverpool's supporters, but they had no complaints when he escaped down the left flank and crossed invitingly for Gerrard to side-foot a crisp finish high past the unfortunate Casillas. Indeed, only the excellent Casillas stood between Real and a rout, saving superbly again from Gerrard as Liverpool displayed the freedom of a side that knew their ticket into the last eight of the Champions League was already stamped. When Real did pose a threat, which was hardly ever, Liverpool's rearguard remained resolute on a night that offered little other than frustration for the legendary Raul and his colleagues. Torres' night ended as it started, when he was denied by the diving Casillas, this time from a rising first-time effort. He was substituted to a standing ovation, but if Real thought that was the end of their punishment they were mistaken as the unlikely figure of Dossena arrived unchallenged in the area to turn the fourth past Casillas. Liverpool departed to rapturous applause at the final whistle - fully deserved after a performance that signalled a warning that they will once again be a serious force in the latter stages of the Champions League. BBC Sport Player Rater man of the match: Liverpool's Fernando Torres on 9.10 (on 90 minutes).